Did you know that your attitude, outlook and mindset are a choice? Every day you roll out of bed and do your morning, afternoon and evening thing only to do it all again the next day. There are days that can seem monotonous. Life is not easy nor was it intended to be. The quality of our life heavily connects to the decision to roll with negative or positive. It seems simple enough, but rolling naturally into a positive state of mind isn’t easy for most people. Take a look around at society, struggles we face as humans and life’s daily challenges and it is easy to succumb to negative. Super duper easy. Know this, life is ridiculously short and the quality of our life will be enhanced when we opt to pursue the power of positive thinking. Why rock out the positive? Health. 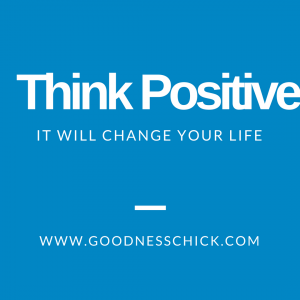 Our decision to maintain a positive or negative outlook is exactly that, a conscious choice. A great motivating factor in opting to jump on the positive train is the health benefits. When our minds are healthy and focused on a ‘glass half full’ instead of ‘glass half empty’ there are proven health benefits for our heart, decreased stress and has a hand in extending longevity. Pretty cool, huh? Attractive. Seriously, do you know how refreshing and inspiring it is to be in the presence of a positive person? There is SO much negativity in the world and and from those we have daily contact with. Positive inspires while negative is ultimately toxic. When we face challenges, heart ache and we remain steadfast in positive thinking it provides a resiliency that negativity cannot. Observe yourself for an entire day. Seriously. Jot down the positives that come out of your mouth vs. the negatives. What’s your standings? From the coffee you accidentally spill, the comment made about a relative or what is said when you look at yourself in the mirror; the words that leave our mouth impacts our self image and our view on the world around us. We are harder on ourselves than we realize. It’s easy to have unrealistic expectations of others that evokes negativity. It’s just not worth expending energy that gets you in the hole and lowering yourself. The Huffington Post kicked out a great article on how complaining actually rewires your brain. Another article of reference on the life long positives of being positive is found at Health Ambition. I believe the more we guard ourselves with positive the stronger and healthier we really are. Maybe you are surrounded by a heap of negative. How the heck to I dodge that bullet? You can’t snap your fingers and go all Genie on life, but you can extract yourself from certain situations. Or how about the choice to detach from those who simply bring you down vs. bring you up? It’s ok to change. It’s fair to protect your heart and mind. I believe negative can beat the crap out of your heart and mind. Shun it. Consider it your kryptonite. During different seasons of my own life I’ve reevaluated how my positive odometer is faring. I have had to step back and knock some sense into myself in how I think and words that pop out of my mouth. There have been decisions to step back from friendships or acquaintances to protect my positive vibe. Fighting for yourself is a beautiful thing and the reward is well worth it. Goodness: Do something of yourself for someone else, no strings attached at least once a month. When we go beyond ourselves, it feels great, provides a sense of meaningfulness and boosts self worth. It’s a no lose effort. Prayer: Take time to clear your mind, ask for peace and for negative to be replaced with positive. There is tremendous power in prayer. Endorphins: Our body and mind vibe better when we not only feel good about ourselves, but we are moving and grooving. I’m not saying to register for a half marathon, but when we are sedentary it is very easy for negative to seep in about our self image and the world around us. Rock out a 20 minute walk, bike two or three times a week. Or hit the gym, park or move those arms and legs around while cooking dinner or pumping gas. Get creative. Seriously…you can! If you look around you it can feel like negative, sadness and hatred are knocking on our doors. Here’s the deal, don’t answer. Positive is power, but it is your choice. Teens will have to choose to take on positive over negative just as someone in their eighties or nineties. It is a conscious decision. When the words and actions of our own life align to uplift and encourage it will alter your outlook on life. It will place things into perspective and priorities in alignment. You will sleep better. Going about your daily routine you will feel better about yourself and gravitate towards other positive people and bob and weave away from those who opt to be toxic. Fight for you. It is a fight that has life altering benefits. No matter what age this challenge reaches you, it is never too late to change. Never. As long as you are breathing you choose how you look at life. So with a new day comes new opportunity. May we take time for us, personal challenge and growth; because we are worth it! Peace, love & goodness!